“Can I have a puppy? Can I have a kitten? Can I have a pet bird, frog, fish, mouse…?” Sound familiar? Somewhere around the age of two or three these questions start like a childhood anthem. Kids just love pets, and we’re lucky enough to have a very fluffy cat as part of our family. But if it was left to the kids our cat would rarely be fed, watered or brushed, and his litter tray would never be cleaned out. Big L and I don’t mind doing these things to look after our furry friend, we like having a pet, and the kids are still learning about these responsibilities. But some friends of ours bought a cute little puppy a few months back, and now we are being asked for more pets. We’re not ready for more yet (and I think our cat would be hugely put-out if we brought home a dog! 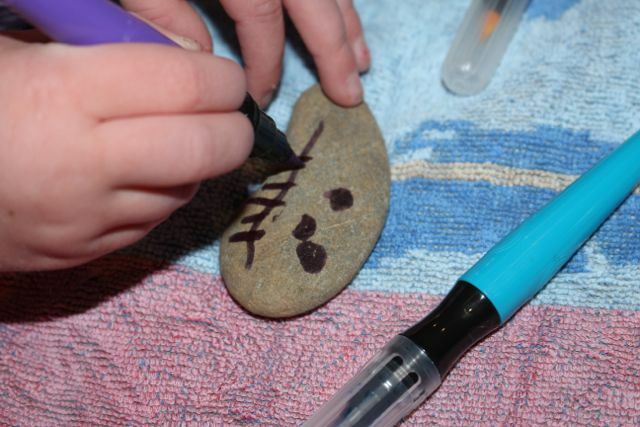 ), so we decided to make some pet rocks. These are the kind of pets that don’t take up much room, and they don’t mind if you forget about them now and again. 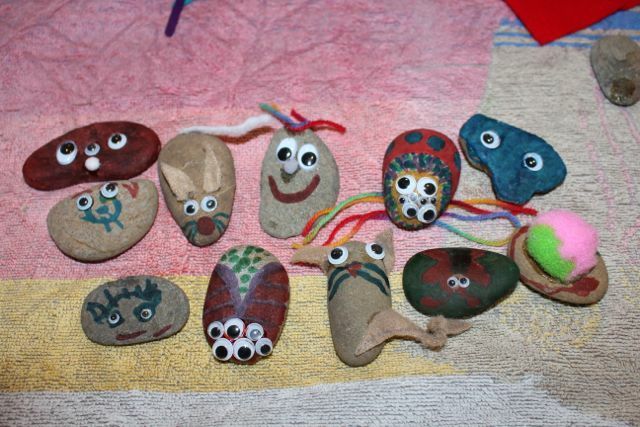 Some of our pet rocks. We picked out a number of large smoothish rocks and pebbles from one of our garden beds to use for our pet rocks. 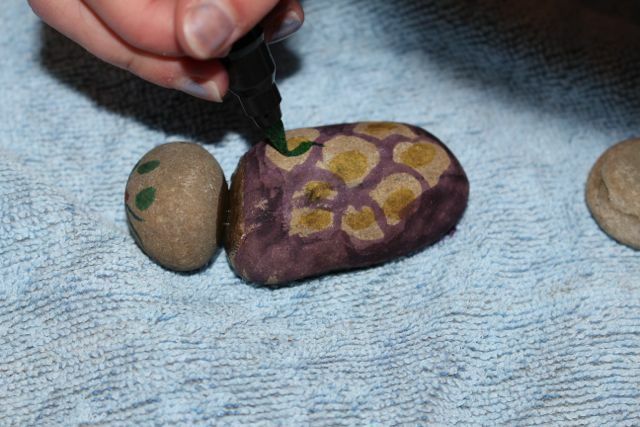 The smoother the rock, the easier it was to paint. We used paint pens (by Crayola) for ease of painting. These are used like a pencil or crayon, making them easy for A, and give a quick dry, no drip paint experience. If we had used the craft paints we have the effect would have been more vivid, but it would have been messier. Since we were stuck inside due to the weather, the paint pens were a better choice for us on the day. I would like to make some more with other paints outside another day for a different look. 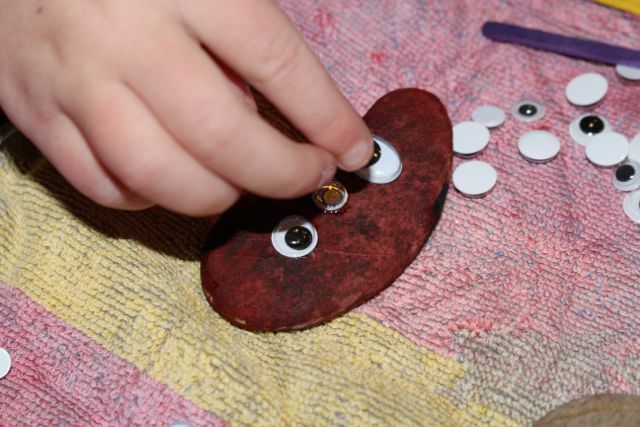 Once the paint was dry we stuck on googly eyes and used felt scraps and wool scraps to give them some personality. The felt was great for ears and tails. L also used some mini popsticks to glue onto one of hers for legs. 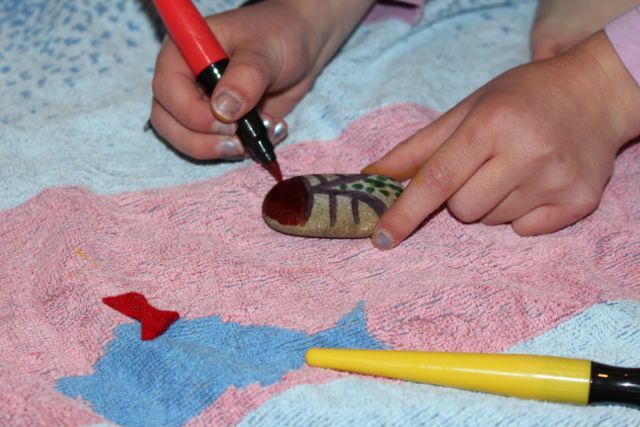 She tried gluing some of the rocks together to make bigger pet rocks, but it took ages for the glue to dry, and it was hard to get them to stick together well. They look so good, easy to look after and no cleaning up.